If you’re looking for I-Zone, you might not see it right away. It’s tucked away in the right side of the emporium, and you need to cross a road to get there from the main emporium lot. It occupies a special place in our campus culture, being one of the two main places where students get their ever-popular late night calzone fix. 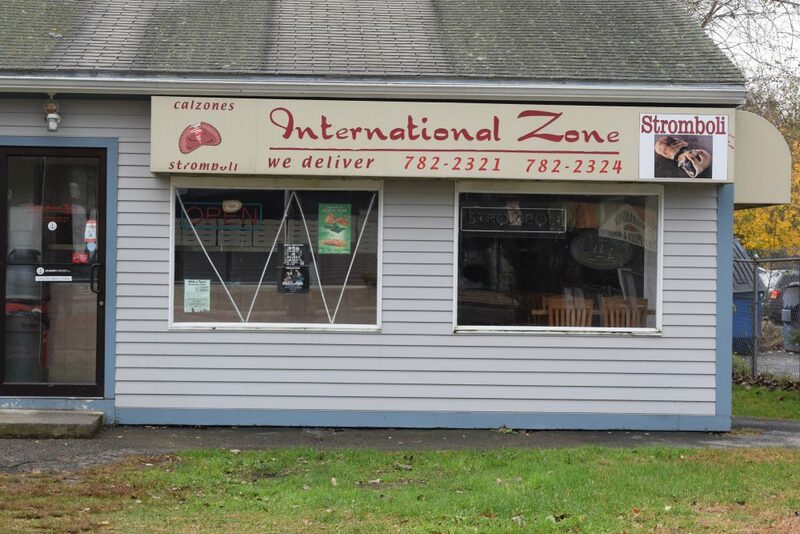 However, I’ve only ever had my calzones from the Rhode House, so I was excited to give I-Zone a try, because I know they both have their own dedicated followers. The building is small, with a few tables along one wall, an L-shaped counter, and stacks of calzone boxes around the place and on the counters. The largest menu is a cardboard sign over the countertop with a long list of calzones, and for some reason, the Ben & Jerry’s ice cream selections, with a smaller digital menu in the corner. It’s overall sort of run-down in appearance, even though the walls seemed freshly tiled, but a severely cracked window and some very old wood along the molding was quite unattractive, along with some old-looking air conditioners. The small space was alright for a quiet Monday night, but I’ve seen how crowded it can get on the weekends. Thankfully, none of this talk is too consequential, because it’s truly all about the calzones — typically a “get in and get out” or just order delivery kind of place. So, I didn’t break with tradition, and I got my calzone and got out, after waiting only about 10 minutes. I had the mozzarella sticks, an order of 7 for $7, and a chicken parmesan calzone, for a total of total of $17 and change. To be fair, I’m usually a fan of more insane options, think buffalo barbeque chicken mac and cheese and the like, but I stuck with two tame options to get a better idea of what an average person would have, especially calzone novices, like URI freshmen. My calzone was still mostly hot after the walk from the top of campus to the sophomore complex, but my first impression of the mozzarella sticks wasn’t good — they were dry, sickly-looking and tasted awful. I can honestly say that the main flavor was of grease, and decided the supermarket mozzarella sticks are better by a wide margin. Despite that, the calzone was really the main event. The dough was thinner than I expected, but it had a good texture and flavor. The chicken was diced, and was perfectly acceptable, while the sauce was a little bland but worked well in combination with everything else not to be overpowering. What really struck me was the excellent cheese, combined with the flavor of the dough to give a subtle savory flavor to the whole calzone, which was completely addicting. As a bonus, the cheese was baked into the top of the crust, which made it look delicious from the outset. Even though the flavor wasn’t anything to write home about, I could not stop eating it, and I could see easily how it could be a regular habit, and there isn’t much more you can ask for from late-night food. The fact is, there’s no clear winner between the calzones here and the ones at the Rhode House. It’s clear to me that calzones at I-Zone are absolutely a solid choice when you get an inevitable calzone craving. I’d recommend ordering out, though, and skipping the mozzarella sticks. If you can do that, then it’s hard to say no to a calzone from I-Zone.